If you decide to add one thing to your new years resolution or your existing workout, make it stair climbing. The plyometric motion undertaken strengthens the same muscles which are used during running, squats and lunges. They tax your lungs and heart as you drive yourself to the top and back down again. With gravity working against you it helps build strength, power & endurance. These key elements are exactly what is needed by those who run. For those who don’t run but want to increase strength without joining a gym, it is a great alternative. Finally, climbing stairs sky rockets accelerates your heart rate extremely rapidly and makes you breathe faster to take in more oxygen. The side effect of this is it, improves your VO2 max.VO2 max is the maximum amount of oxygen you can utilise during intense exercise. It can help train your body to use that oxygen and convert it to energy quicker. A study in the British Journal of Sports Medicine found that short rounds of stair climbing five days a week for eight weeks improved VO2 max by up to 17 per cent among young women. We all know that walking is a safe and effective exercise option for getting our daily 30 minutes. So how do we take it up a notch so we can really start seeing some results? In short the answer is stair climbing, a good set of steps comes with many health benefits. Because the body is being lifted upwards as you climb stairs, leg muscles are engaged and consequently strengthened. But the best thing about Stair Climbing – Strength and Cardio Workout? Raising the heart rate is crucial for weight loss, (especially fat loss). Stair climbing is synonymous with raising heart rates. 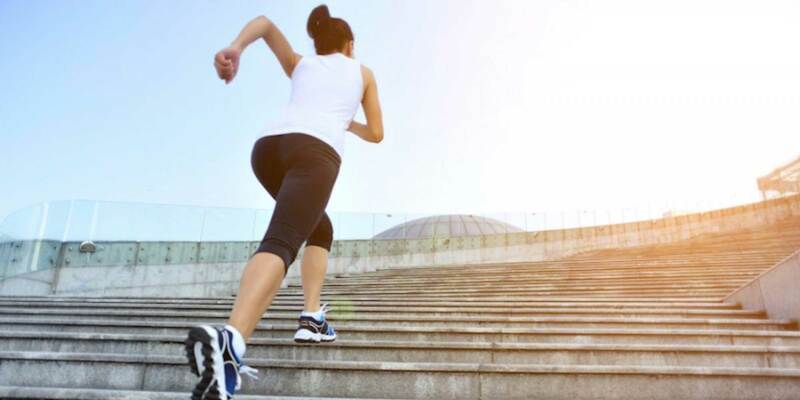 The simple actions of stair climbing require the body to use key muscle groups in order to reach properly execute, plus the heart needs to work even hard to supply oxygen to each muscle and to sustain the pace. Stair climbing is a great form of cardio because it really gets the heart pumping as well as working the muscles hard. Stair climbing naturally raises our heart rate. As such, you are protected against blood pressure clogged arteries and weight gain. This generally improves the body’s cardiovascular fitness. Because you are working against gravity and propelling yourself upward, this vigorous activity will ensure that you get a great cardio workout at all times. In case you cannot constantly run up and down the stairs, power walking down the steps between intervals will also keep your heart rate elevated. You might not realise this, but when you climb stairs you can get a great core workout. Stair climbing is an easy and effective way to engage your core, which overtime will strengthening it. When climbing stairs, your body needs to be kept upright, and the hips need to be facing forward. In order to maintain this position, your core really needs to work to prevent sloppy form and hips going in all directions! Activate your core by pulling it in towards your spine. Think like a solider and stand up straight. Everyone these days wants those perfectly rounded glutes, and guess what? Squats aren’t your only hope! Stair climbing requires you to push off through the foot, up through the legs, and into the glutes in order to power you up to the next step. You can activate the glutes even more so by concentrating the push-off section of the movement into the heel. Your physical activity focuses on your leg muscles which overload and pull sufficient strength and weight. Climbing stairs may be more strenuous but it builds more muscle. While walking, running and jogging may focus on the legs, these activities only tone muscles. You do not have to sweat it out while climbing stairs, consistently going up and down a few steps on a daily basis will give you the muscle workout that you need. So if heavyweights or the squat rack have you running for the hills, then stair climbing for your glutes is your jam!!! Any cardiovascular exercise is great for reducing the risk of disease, but stair climbing is especially good. The increased heart rate reduces the likeliness of clogged arteries, high cholesterol, and ultimately, heart disease. Stair climbing is additionally beneficial for the musculoskeletal system as it relies just as much on the muscles as it does the heart. By stair climbing it allows muscle and bones to strengthen together, it can also drastically reduce the risk of osteoporosis. Choosing to take the stairs whenever you can, lowers your blood cholesterol and naturally slims your physique. If weight loss is the goal, then add stair climbing to your workout routine IMMEDIATELY. The intense cardiovascular workout burns a high number of calories, which will help with the calorie deficit which is crucial in the early stages of weight loss especially. The muscle-strengthening properties of stair climbing also help with weight loss as muscle growth speeds up fat loss, which will help towards lowering your body fat percentage. Most people prefer to stick to the flat and small hills when it comes to exercising. While running up and down a bunch of steps might seem more suited to folks that do fun runs, half marathons, the reality is, there’s value in it for everybody. Include these stair workouts into your weekly training and see your performance and statistics reach new heights. Climbing stairs is a more powerful alternative to walking. In comparison to walking at a faster pace, climbing stairs at a normal pace can burn up to two or three times more calories per session. Many people hate cardio, so when you need to indulge walking for 30 minutes burns up to 150 calories. However, climbing stairs can burn the same amount of calories in half the time (15 minutes). Results don’t occur after a single session, so don’t expect it! With such a powerful exercise and the range of movement, you will have a period of adjustment. You will start feeling stronger within a week and over a prolonged period of time. Beginning with small steps as they will add up to big gains. Ensure that you make a slow and steady progress. Starting with a few flights of stairs or for short period of time is the best way to go. Then move onto, doing 4 or 5 easy repeats of 40 to 60 stairs, alternating between doing two steps at a time and one step at a time. Remember, building a stair climbing regime and sustaining it overtime will make a significant difference to your long-term well-being. Stair climbing is easy to adopt because it does not require any special training or skills. Also, it is an extremely efficient workout routine that saves time, and can be done during your lunch break. Focus on good technique and not speed. The recovery is the run back down. Take care and descend one step at a time as it loads your quads up a lot less and is much safer. Do this once a week for a couple weeks before slowly increasing the speed and number of reps. The end goal should be 5 to 10 sets of 60+ stairs, but it could take around three months or more to reach this point. These stair workouts aren’t for the faint-hearted, we want to raise the heart remember? Were going slow up and fast down. Doing this helps build endurance because you are putting out a more consistent effort. It also is a great calf burner, since you rely on your calf muscles to soften your steps as you come down. The Workout: Warm up for 10 minutes. Then climb 20 to 30 seconds up the stairs at a tempo effort – slowing as needed to keep your ascending pace consistent – and without pausing, run back down. Repeat the cycle for 30 minutes.